In the 1990s, when Jess Steele and Richard Walker ‘inherited’ the space to make the garden, it was an absolute dump site with a broken-down fence, rubbish thrown in and full of tall-grown weeds. At the time, next to it was ‘Heathers’, a restaurant keen on locally-sourced food. It is hard to imagine that sourcing food locally was really cutting-edge at the time and not common at all like it is now. Jess, a history campaigner, and Richard, an environment campaigner, had set up the Deptford Discovery Team – a kind of co-operative consultancy. It was a pool of people who could work when they had time and who got paid on an ad-hoc basis. In 1996, Groundwork London had won a large pan-London regeneration bid which included Deptford and East Greenwich but didn’t have a local trust to run it. Deptford Discovery Team won the tender to manage the programme called Vital Centres & Green Links which ran from 1996 to 2003. One of the many local projects was to transform the derelict site into an educational herb garden. As the space was Greenwich Council property, it was tricky to get permission so Jess and Richard talked about it as a temporary project to make use of the land until it was needed – an early example of ‘meanwhile’ use. But one of the most important decisions they made right at the beginning was to build an architect-designed wall to protect the space and enhance the look of the neighbourhood. This cost £20,000 but was worth every penny and it makes for a very durable space. Along with the main outer wall with its peephole windows, smaller walls were built inside the space to make a garden layout and define the growing space. It was mainly Richard and Donna who worked on the layout but it was an open project and all the people worked together. 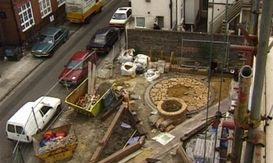 They were also working with the landscape designer Jonathan Cook but rather than him taking over, it was all discussed together. Also some decorative items were placed in the garden to make it look nice, and the story of one item which is still in the garden today is particularly interesting. Four years earlier, when Jess was living on New Cross Road and walked down it every day, she noticed someone taking off a large ornate iron bracket with space for the three golden balls of a pawnbroker’s sign. Concerned about the rapid changes on that road with everything valuable to history being removed, especially since writing the book Turning the Tide (1993), she enquired what the man was doing. He said he was clearing the street of all these ‘old bits of stuff’ so Jess asked him how much he wanted for it. Although he asked for £50 and Jess ran to the bank to get some money, she gave him her last £35 and he accepted. Jess had the sign in her backyard for more than 3 years wondering whether she would ever find a proper home for it, and when the garden project came along the sign’s fate was decided. It was hung on the wall and used to have baskets hanging from its hooks – and it is still in the same place today. The opening took place in 1998 with Nick Raynsford and some other local politicians. The garden was named McMillan Herb Garden, and there was/is an obvious connection with the McMillan nursery just across the road. The McMillan sisters (Rachel and Margaret) opened the world’s first nursery in 1910 focusing on a different learning approach – learning through play. Later Jess edited and published The Children Can’t Wait, a book about the McMillan sisters’ initiative to make learning more enjoyable. It was obvious that the garden and the nursery would work together. The head-teacher of the nursery, Frances Marriott, was given keys so that they could use the garden as often as they liked. Although, the nursery aren’t key holders anymore due to an issue with unapproved copies of the key, the garden and the nursery still collaborate to the present day, and kids’ groups are often seen walking around the garden admiring the plants and artworks in the summer. Jess and Richard managed the garden from 1998 until 2002 during which time Mick Bonfield, the current head of the garden, was commissioned as an Artist in Residence using the garden to work on and display his Portland stone sculptures and by organising music events. As Jess says “Mick is a kind of effortless organiser who never seems to be doing much but always makes good things happen”. As he was more and more around, he took over when the Deptford Discovery Team came to an end in 2004. Richard moved to Bristol, Donna got a job in Camden and Jess moved to Yorkshire and then to Hastings. Mick is still actively engaged in managing and making use of the garden by organising music and poetry events, kids’ workshops and nursery trips. The garden is in constant flux with new plants, new artworks and new designs. Mick gets committed support from Diane, a graphic design teacher from Liverpool, and Richard, a retired art teacher. And of course Sam the dog, Mick’s ever-present companion. There are also other volunteers who come regularly to help, for example, bring tons of soil, some timber for flowerbeds (some timber in the garden used to hold up the Cutty Sark before it burnt down), an anchor in response to the loss of the anchor on the High Street, or to help with planting, grape-picking and other activities. It is unclear what the space was used for, if at all, after WWII. But before the war it was a flop house for single gentlemen. Women living across the road at the time always reported seeing men smoking pipes.